Barilla. 1728. Manila Mint. Basso-1. 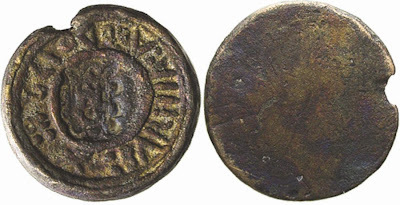 Cast uniface barila with arms of Manila stamped in center. VERY RARE. According to the Central Bank of the Philippines Quarterly Vol. II #1, this type was unknown until 1948 when the first specimen was found in the ruins of an old building in Sto. Tomas.